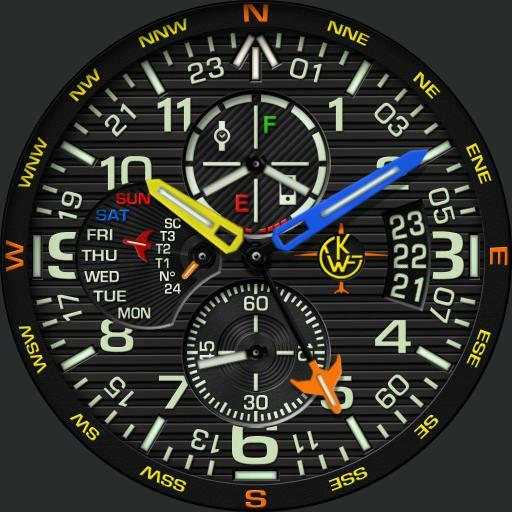 Tap Battery dial to cycle dial colors. Tap Center to zoom and remove compass ring. Tap between 10 and 11 to cycle Hour hand colors. Tap between 1 and 2 to cycle Minute hand colors. Tap 3 area to cycle Large 24 hour hand modes = 24 hour local, UTC, Compass, TZ1, TZ2, TZ3, and Steps count. Left dial has mode indicator hand. Tap 9 area to cycle Lume choices, Blue, Green or Multi.